It probably got its name, "Watergate cake," from the Watergate break-in scandal of June 17, 1972. 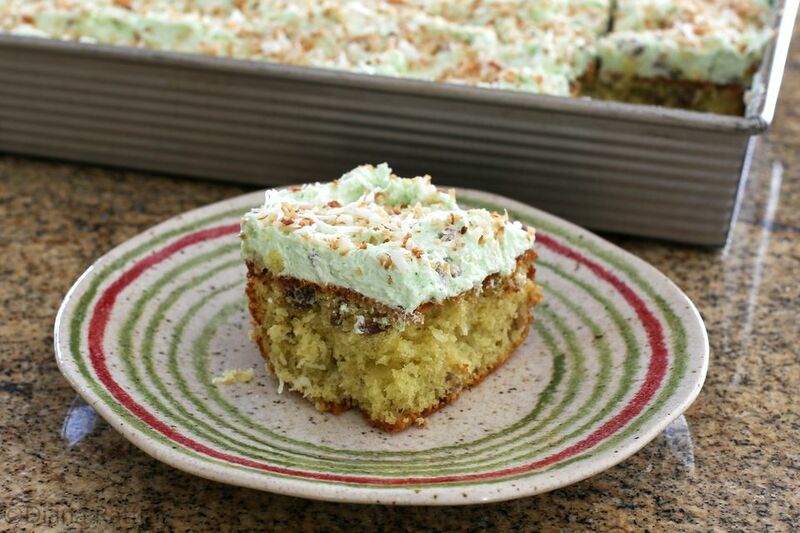 This easy Watergate cake is made with pistachio pudding mix, whipped topping, and a cake mix. Pecans and coconut add flavor and texture to this classic cake. 7-Up soda is added to the cake instead of water, but you may use club soda, Sprite, or a similar carbonated drink. Instead of a white cake mix, you can also use yellow cake mix and the cake will come out moist and flavorful. Toasting the pecans and the garnishing coconut for the topping gives the cake additional coconut flavor and crunch, and adds some nice color. Some recipes call for the second 1/2 cup of pecans to be sprinkled over the top of the frosting. Feel free to do it that way. If you're looking for a coconut cake with a difference, this is a great option. Grease and flour a 9 by 13 inch baking pan. Empty the white cake mix into a large mixing bowl with the eggs, 1 package of the pudding mix, 1 cup of vegetable oil, and the 7-Up. With an electric mixer on low, combine the ingredients. Increase the speed to medium and beat for 1 to 2 minutes. Fold in 1/2 cup of chopped pecans and 1/2 cup of coconut until well blended. Spoon the batter into the prepared baking pan and spread it evenly. Bake in the preheated oven for about 35 minutes, or until a toothpick inserted in the center comes out clean. Cool the cake completely in the pan on a rack. When the cake has cooled completely, prepare the frosting. Combine the two envelopes of Dream Whip with the milk and pudding; beat with an electric mixer until soft peaks form. Add the remaining package of dry pistachio pudding mix and continue beating until well blended. Fold in the remaining 1/2 cup of chopped pecans. Put the coconut in a dry skillet over medium heat. Cook, stirring constantly, until the coconut is well-browned. Remove the coconut to a plate to cool and then sprinkle it over the frosting. Store leftover cake in the refrigerator for 4 to 6 days. According to the Kraft foodservice website, it can be stored in the refrigerator without spoilage for "several days". Any vegetable oil may be used for the cake, but a neutral flavor cooking oil (one with little or no discernible flavor) is the best choice. Canola, corn, safflower, sunflower, grapeseed, or avocado oil are all adequately neutral in flavor.